BLocal artists are using their art to heal the lingering wounds of the 2009 Black Saturday bushfires. A metal dragonfly fashioned from old fencing and barbed wire is one of the works of art at Renewal — A Black Saturday Memorial Exhibition. It commemorates a decade since the Black Saturday fires tore through Victoria, in one of the darkest days the State has ever experienced. A dragonfly was the first sign of life artists Dawn and Gary McDonnell saw on their return to their Nillumbik property after the fires — and it became a symbol of hope and renewal to them. 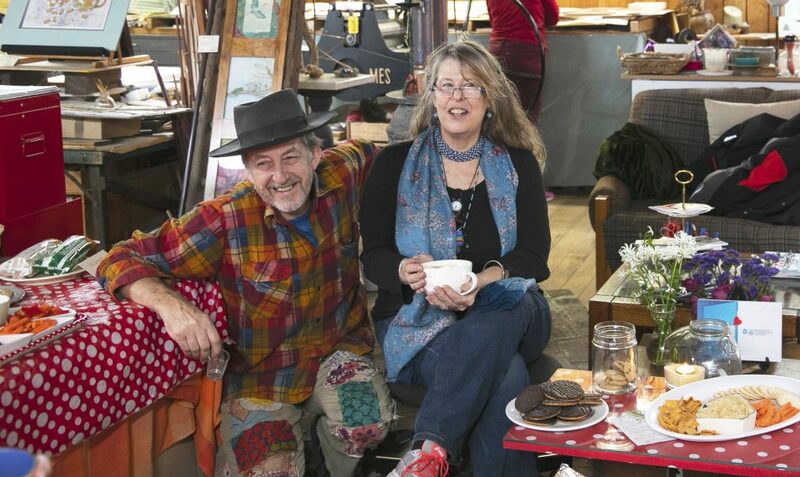 The couple is among 60 artists showcasing their work at an exhibition which runs from January 25 – February 25 at two locations in Nillumbik. Diary contributors, Ona Henderson and Syd Tunn also feature in the exhibition, which gives them an opportunity to reflect on the events of 2009. The pair lost friends to the flames that day, and recall the worrying time spent as the fires threatened their Bend of Islands home. Ona’s contribution to the exhibition, Ancient Silent Sentinels [right] comes through as a message of resilience. Ona explains, “the 2009 bushfires burned hot throughout much of the bush but these graceful grasstrees started to sprout again quite quickly — silent sentinels with black trunk. 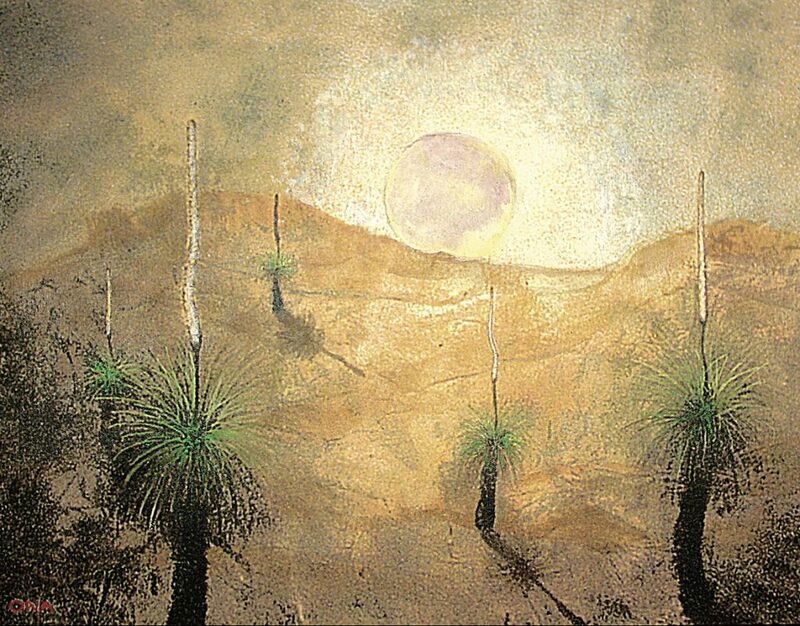 She said that the grasstrees became for her symbols of regeneration, as they often stand starkly in the landscape “to remind us of the ability to stand strong and resilient against the chaos and destruction that follows a huge bushfire”. Nillumbik Shire Council Mayor Karen Egan said like a phoenix rising from the ashes, a feeling of renewal, fuelled by hope and courage, had emerged in the community. “Hope is a flame that burns eternally, and many artists have found creating works of art a cathartic experience,” Cr Egan said. Ona told the Diary of how, in the month’s following Black Saturday, she and Syd healed by collaborating on shared canvases. “We both went through trauma where we could not paint for several months, and then we started painting on each other’s paintings, we started new paintings, which were healing paintings,” she said. Last year, Council put a call out to artists inviting them to exhibit their work. Their art includes a range of mediums — paintings, ceramics, sculptures, etchings, jewellery, print, wool, a digital movie and photographs. Cr Egan said many of the works are paintings that reflect the scars on the landscape that have healed over time – an outward manifestation of emotional scars which are often less easy to heal. Others works of art are less traditional. One is made from latex casts of fallen trees in the Kinglake National Park. Cr Egan said for many artists, creating the pieces on display would have been a cathartic experience. “Some works of art are for sale, others aren’t. “Some visitors to the galleries will smile, others will be reduced to tears. “But what I believe all will take away with them is the message of courage, healing and hope,” Cr Egan said. The exhibitions are at Wadambuk Art Gallery in St Andrews and the Eltham Library Community Gallery. The exhibition was among seven Nillumbik community initiatives collectively awarded Victorian Government grants of nearly $33,000 to mark the 10th anniversary of Black Saturday.